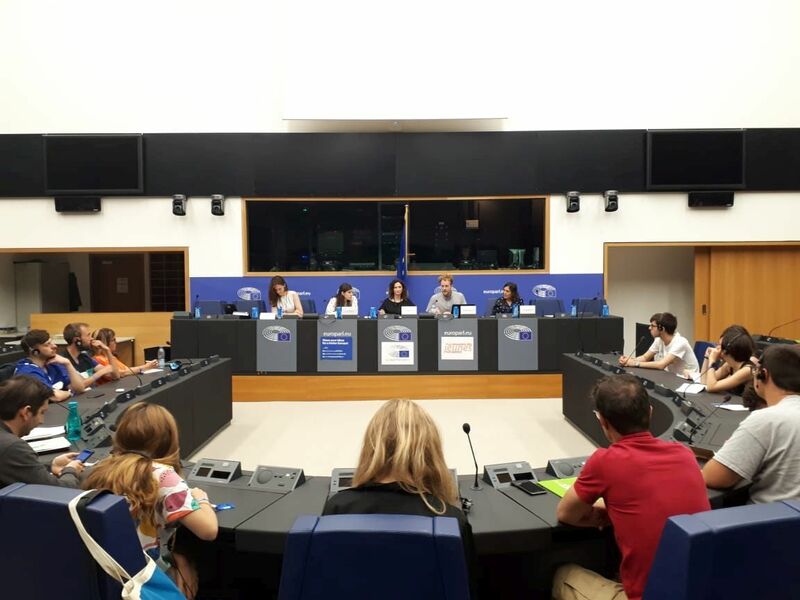 On 1 and 2 June 2018, AQUACROSS researchers Lina Röschel and Hugh McDonald participated in the European Parliament's European Youth Event as invited expert panelists. More than 8000 Europeans aged between 16 and 30, who gathered to learn, discuss, and generate ideas for change in Europe, attended the event. Hugh McDonald and Lina Roeschel drew on their research from the AQUACROSS project and spoke on two different panels under the topic of "Protecting our Planet", discussing biodiversity and ecosystem services conservation in the marine and freshwater realms. In light of the European Parliament elections coming up in 2019, the European Parliament invited experts and the audience to suggest and debate new ideas for Europe. As panelist discussants, Hugh McDonald and Lina Röschel each presented two ideas for addressing their panel's respective environmental challenge, and then discussed these with the moderating Members of the European Parliament and fellow discussants. In a panel on water quality, quantity and availability, Hugh McDonald called for inter- and transdisciplary approaches to protect biodiversity, and discussed the need for economic policy instruments to address European water pollution and scarcity. He joined a panel with Clara Cuartero de Frías, a teacher active in water poverty projects in Spain and Nicaragua, and Antonella Vagliente, co-founder and managing director of international NGO Young Water Solutions, and moderated by Irish MEP Lynn Boylan. Hugh McDonald drew on research from the project AQUACROSS to argue that protecting biodiversity requires not only cooperation with scientists of every stripe - including ecologists, biologists, sociologists, economists, and more -, it also demands collaboration with diverse voices from local society. He also called on the European Parliament to employ economic policy instruments to ensure that those who use and pollute Europe's water pay for it. As part of the panel on "Ocean protection: Hooked on heavenly habitat", Lina Röschel engaged in a panel together with Marcella Hansch, the Founder of Pacific Garbage Screening, Eugene Kitsios, a nature photographer that aims to educate about the environment through visual stimulation, and Tiemo Wölken, the youngest Member of the European Parliament. Lina was called as an expert on overfishing, which remains the greatest threat to Europe's Seas. Lina Röschel discussed AQUACROSS findings on the challenges of the European policy framework in place to protect aquatic biodiversity and argued that the European Parliament could regulate exploitative fishing from the consumer's standpoint. If there were an EU-wide, easy-to-read label for fish and other sea-products in place, consumers would be prone to make better, more sustainable decisions when purchasing aquatic produce. Consumers want to buy sustainable produce, but current labelling schemes are either too confusing, not applicable across the EU, or may not consider all the important variables. An EU-wide label funded by the European Union, for produce from European seas as well as imported products, would simplify sustainable lifestyle choices for EU citizens.